In what will be a major milestone, not only for SpaceX, but for the entire space program, International Space Station (ISS) teams are working through the long list of safety requirements to approve Dragon’s debut ‘test’ mission to the orbital outpost. Several specific areas of interest are in work, including ongoing evaluations into the potential hazards from “secondary payloads” on the Falcon 9. The plan to combine the second and third of three planned Commercial Orbital Transportation Services (COTS) demonstration flights (C2 and C3) for SpaceX’s Dragon has already been agreed in principle, with a preliminary launch date target at the end of November. Thanks to the success of Dragon’s debut trip into space – carried out on only the second Falcon 9 launch – there is a large amount of confidence SpaceX can take the next step, the final stage of testing ahead of starting Commercial Resupply Service (CRS) runs to provide the ISS with a small – but important – part of the upmass capability that has been lost since the retirement of the shuttle fleet. However, as with all “Visiting Vehicles”, even approaching the ISS requires numerous safety requirements to be passed, procedures which protect the $100 billion Station from undesirable incidents which could threaten both the ISS and it’s crew. Highlighted as the main item of interest currently being worked by both NASA and SpaceX, engineers are evaluating a “concern” relating to “Secondary Payloads” riding with the Falcon 9 into orbit. 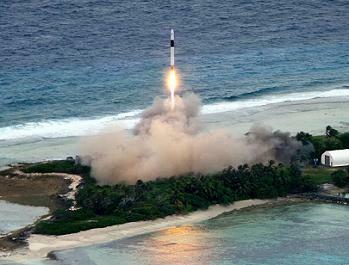 The Falcon 1e sports upgraded propulsion, structures and avionics systems when compared to the Falcon 1 – in order to further improve reliability and mass-to-orbit capability. However, SpaceX – working to further maximize the cost-effectiveness of their COTS/CRS missions – decided to included the additional payloads as passengers on the Falcon 9’s second stage, allowing them to be deployed after the Dragon separates from the Falcon 9. SpaceX also acknowledged this ongoing work, citing they were working with NASA to resolve the potential risks associated with the secondary payloads. “Over the last several months, SpaceX has been hard at work preparing for our next flight – a mission designed to demonstrate that a privately-developed space transportation system can deliver cargo to and from the International Space Station (ISS). NASA has given us a Nov. 30, 2011 launch date, which should be followed nine days later by Dragon berthing at the ISS,” noted SpaceX. “NASA has agreed in principle to allow SpaceX to combine all of the tests and demonstration activities that we originally proposed as two separate missions (COTS Demo 2 and COTS Demo 3) into a single mission. Furthermore, SpaceX plans to carry additional payloads aboard the Falcon 9’s second stage which will deploy after Dragon separates and is well on its way to the ISS. With safety reviews a standard for NASA, the procedures are already being lined up through their respective phases, with phase 3 expected to be completed early next year – likely relating to a green light for the opening CRS flight for the Dragon in 2012. Known also as Falcon 9’s Flight 4, the CRS-1 flight hardware is already well into production, an in-house process which is undergoing a ramp up in the fabrication of the Falcon 9s – three of which will be required for the 2013 debut of the Falcon Heavy at USAF Vandenberg in California. “Significant additional tooling and automation will be added to the factory, as we build towards the capability of producing a Falcon 9 first stage or Falcon Heavy side booster every week and an upper stage every two weeks. Depending on demand, Dragon production is planned for a rate of one every six to eight weeks. 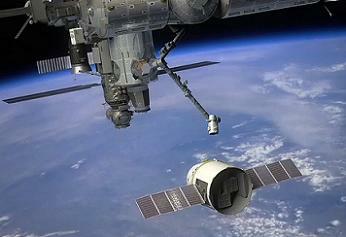 As SpaceX rightly note, the arrival of the C2/C3 Dragon at the ISS this year – as much as the mission may slip into 2012 due to a tight schedule from the ISS side, per sources – will be a key milestone for commercial space flight, as the cargo Dragon docks and is ingressed by the crew of the ISS, marking a historic first. 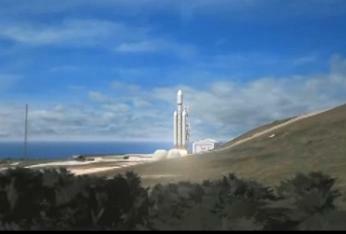 “This next mission represents a huge milestone not only for SpaceX, but also for NASA and the US space program. When the astronauts stationed on the ISS open the hatch and enter the Dragon spacecraft for the first time, it will mark the beginning of a new era in space travel,” noted SpaceX. The most recent milestone for this potential combination demo mission was carried out at SLC-40 at Cape Canaveral in Florida, with a successful Wet Dress Rehearsal (WDR) carried out on the Falcon 9 Flight 3 vehicle. (Images: Space X) (As the shuttle fleet retire, NSF and L2 are providing full transition level coverage, available no where else on the internet, from Orion and SLS to ISS and COTS/CRS/CCDEV, to European and Russian vehicles.